The male English-speaking guide at Suwon’s tourist information booth was the most helpful one I met in Korea. On this map, he listed all the bus numbers, where to get off and on, and most importantly, the best galbi I had in my life. Take an-hour train ride from Seoul to Suwon and take the free shuttle at the tourist information booth to see Hanguk Minsokchon (Korean Folk Village) and try to catch a performance. Lunch at the Korean food court in the village. But because I was going to Andong on Day 4 and Andong has a more authentic village, I skipped this. Take the shuttle back and from the tourist info booth, take a 20-minute bus ride to Suwon Haeng-gung, a temporary palace where a king rested or retired from war. The very popular drama dae jang geum 大长今 is filmed here. You should also catch the performance outside the palace (pictured below). After the palace, walk behind the palace to the Suwon Hwasong, a UNESCO site, the fortress wall that used to surround the city. It’s a 5.5km, taking 2.5-3 hours of walking, or take the “Dragon Train.” But the train doesn’t run during inclement weather. At the end of the fortress, before you return to Seoul, you MUST-EAT Suwon galbi. Suwon is famous for their marinated beef ribs (galbi) using charcoal grill and when I ate it, it made me cry. So good! 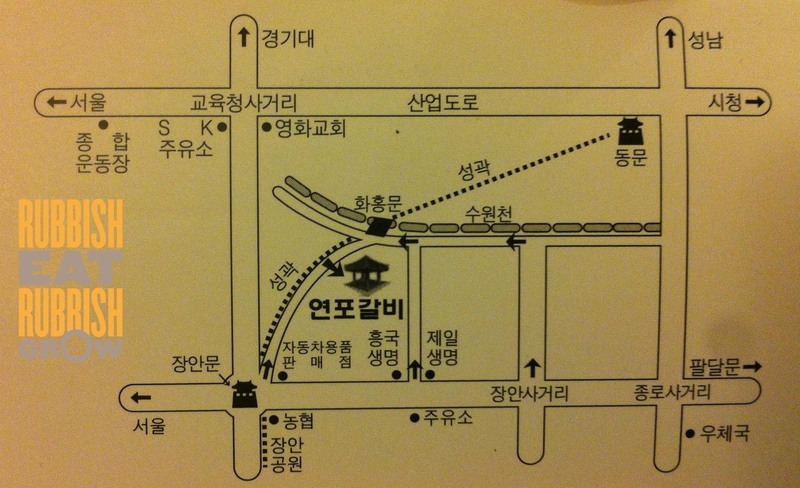 Address: 56-5 Jeongjo-ro 906beon-gil, Buksu-dong. For the young-at-heart or families with children, Suwon also offers Everland, Korea’s largest amusement park, and 5th most popular in the world. Beside the theme park, Caribbean Bay is a water park, requiring a separate admission fee. There are two ways to get to Suwon from Seoul, the subway or KTX railway line and I strongly suggest the latter because the subway takes 75 minutes from Seoul Station and it is crowded, whereas KTX has assigned seats and takes 30 minutes and costs only about ₩3000. To take KTX, go to Seoul Station and buy a ticket. To take the subway, line 1 to Suwon Station. Free shuttle bus at Suwon Station. Performances: Farmer’s music & dance: 11am & 2pm; tightrope acrobatics 11.30am & 2.30pm; traditional wedding 12pm & 4pm; horse performances 1 & 2.30pm. From the tourist information booth, walk 5 minutes to the big bus-stop, take bus no. 11, 13, 36, or 39 to Paldalmun stop, a roundabout with an old fortress gate in the middle. When you’re returning back to Suwon station, take the same bus numbers but use the bus-stop outside Lotteria (a Korean fastfood chain) at the same roundabout. Haeng-gung Performances: 24 Martial Arts Demo Mar-Dec 11am, 3pm Tue-Sun; Permanent Event Mar-Nov 2pm Sat only; Jang Yong Yeong Guards Ceremony Mar-Nov 2pm Sun only. Bus 66 from Suwon Station. Or bus 5002 from Gangnam Bus Station or Jamsil Station. Wow, this looked so delicious. I must let my daughter know. She’s going to Korea year end. I hope she has time to visit this place and restaurant. This is the best galbi I ever have in my life. It is so good and complex, with a slight tinge of coffee! Your daughter must really, really try it. 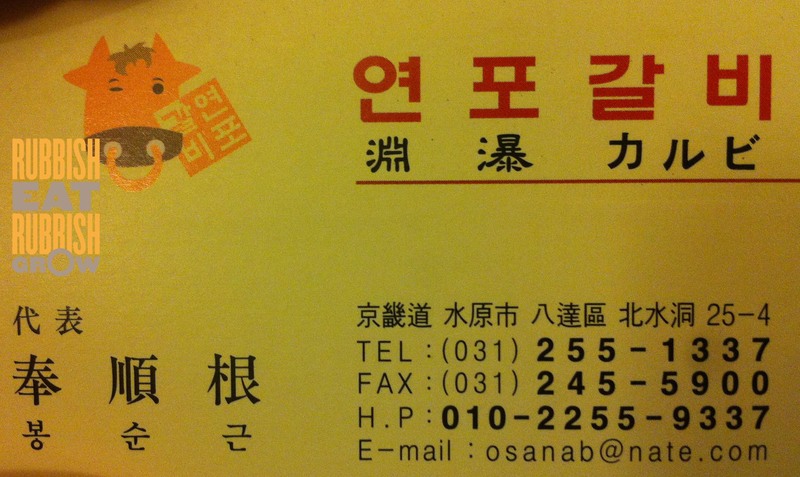 If she doesn’t have time to take a day trip out of Seoul, ask her to try Byeokjae Galbi (벽재갈비). It’s much more expensive (about S$180 per person) but the quality of the meat is heavenly. The oxtail soup at Namdaemum is superb too. Thank you, I will inform her :D Thanks for the link. 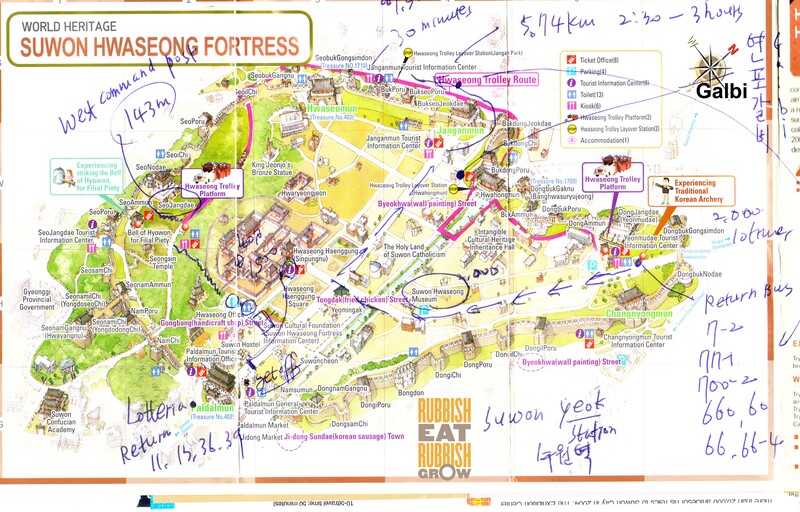 Suwon Hwaseong Fortress seems quite vast now that I looked at the map… Planning to go there this coming spring and your blog is quite informative. It seems here you’re saying it’s possible to visit the folk village and the fortress on the same day, right? If you reach the village at 9am and end at noon, and have a 10 min lunch, you can do two places. But it’s very rushed. Takes about an hour to reach suwon from seoul and another 30-40 min to reach the folk village. So you’ll have to wake up early too.